There is a significant variety of natural conditions in which pelargoniums grow. The fundamental distinction is between winter- and summer-growing species. The latter are probably slightly easier to keep, respond well to light, water and feed and often grow into large plants. Many of these successfully withstand some drought, require a period of rest in the cooler season and flower while in leaf. The winter growers are usually smaller species, and require short days to trigger growth upon which they respond to watering by leafing up. Tuberous hoareas flower after the leaves wither, but equally tuberous polyactiums flower in winter. Shrubby winter growers flower at any time of year though mostly while in leaf. Finally, some species inhabit regions with sporadic rains at any time of year and these will opportunistically respond to water whenever available. A typical example is P. xerophyton, though regardless of when we induce growth, these plants still require a period or rest. There are few species that can withstand scorching sun well (P. klinghardtense), and many of the smaller species either grow on south-facing slopes or in the shade of larger plants, so may require some shading, and some disappear entirely during the summer (P. sibthorpiifolium). The key to growing pelargonium species well is to identify their growth season and light requirements, and to adjust the watering regime to the available heat and substrate. While it is certainly possible to overwater pelargoniums, I have lost many more due to heat and drought, either because of my lack of understanding of their water requirements during the resting period or because of trying to grow them in small pots, not appreciating the fact that many species, even the small hoareas, develop large root systems once established. 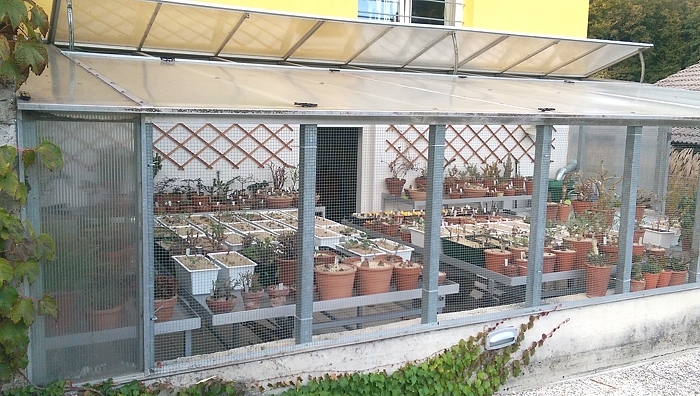 The following paragraphs summarize my experiences of growing these exciting and varied species in a greenhouse in a typical central European climate (Fig. 1), though hopefully useful elsewhere as well. Fig. 1: Greenhouse culture may require substantial light and heat management at any time of year. And in addition, smart space management, otherwise the greenhouse will become too small too quickly. Pelargoniums like their personal space. In nature, some grow in rock crevices or shallow sand (e.g. P. leptum) in apparently very little soil, however, their roots find ways through cracks wherever possible. Many share their habitat in small groups, so growing several plants in a single large pot or trough works, as long as this is deep enough for the root system to develop fully. Many tuberous species develop not just the main tuber but an extensive system of side tubers as well (e.g. P. sibthorpiifolium), the larger this system is, the more established is the plant and the easier it withstands prolonged drought. It is easy to imagine that the large P. sibthorpiifolium colony in Fig. 2 in fact consists of only a few distinct plants. Fig. 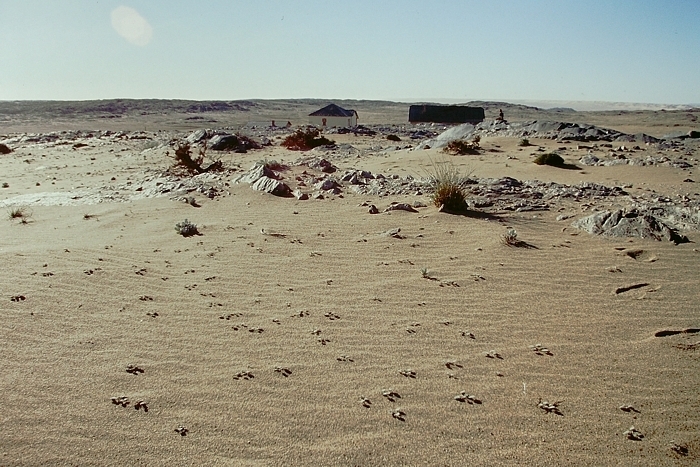 2: A substantial P. sibthorpiifolium colony near Kolmanskop in southern Namibia. The tubers of these plants are very deep, 30-50 cm beneath the dune surface. Therefore, attempts to fit as much as possible into the available (greenhouse) space by planting into small pots almost inevitably results in a disaster as root systems cannot develop fully. The root system starts about 10 cm deep for most species, except for the true miniatures, such as P. saxatile. Most shrubby species (e.g. section Pelargonium) will do well in very large pots (5 L or more) or planted in the ground, winter conditions permitting. Additionaly, small pots make it more difficult to control water and moisture and dry out too quickly. Pelargoniums like their necks dry. Even sarcocaulons, some of which can be difficult to keep over the summer in a peat-based compost, leaf up nicely in early autumn in a loam-based compost. Growing pelargoniums in Ljubljana (Slovenia), in a typical central European climate, means very hot summers: even with one greenhouse wall removed and the roof vent open, and with a 50% shading net cover over the roof, the inside still easily warms up to 40 oC and more. Some Cortusina and Otidia species love such conditions, and I keep them close to the open window to experience as much direct sunlight as possible, but most Hoarea plants like the shade of larger shrubs. 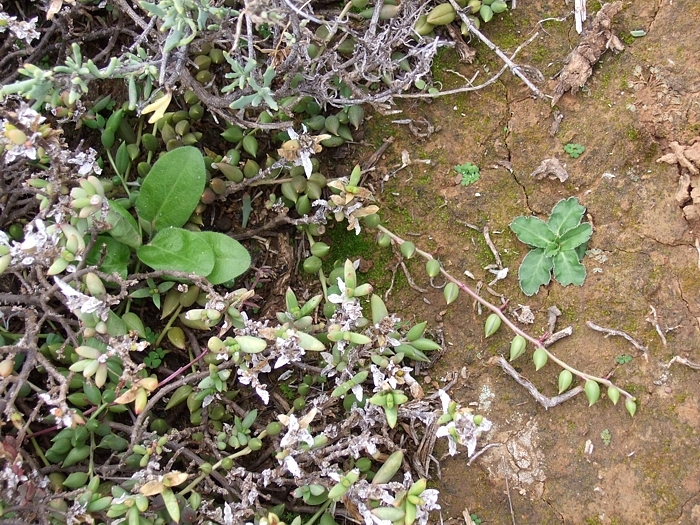 Compare P. ochroleucum growing in the shade and in the open: two unrecognizably different plants (Fig. 3). Fig. 3: Two P. ochroleucum plants growing near Uniondale, one nicely sheltered in a bush, the other one exposed to full sun. Heat dries out peat into un-wettable dust to which small root hairs can no longer cling, thus these dry out and the plants die of thirst regardless of watering. Once peat dries out it simply doesn’t soak up water easily. It is possible that peat-based composts work better in cooler climates, however, even in London, peat doesn’t seem to work well as it dries out in the summer. Lots of quartz-based sand, 0-5 mm, probably 2/3 of sand and 1/3 loam-based planting medium mimics natural growing conditions well and it gives good control over water and feed. I use small amounts of peat as an organic fertilizer, but not as the base of the growing medium. A method of planting that seems to work well is such that a trough is first filled to 1/3 with 1/2 planting medium and 1/2 sand. The roots are then spread over this, and the rest of the pot can be filled with almost pure sand. Pumice usefully reduces the weight of pots and provides an additional source of minerals. This ensures that the necks of plants dry out quickly, while the fine roots remain hydrated. Even if dried out, loam-based compost hydrates easily. Pelargoniums like their feet cold and moist: in nature, there is usually moisture available beneath the surface, and high temperature differences between day and night lead to condensed water wetting the soil surface on a daily basis. Using the above compost, watering established plants once a month is enough, exceptionally more often, particularly young plants. I always supply as much rainwater as is needed for it to emerge from the holes of a pot to ensure that the bottom layer of loam soaks up all the water it needs. Due to the substrate and pot size, and most being plastic, there is little need to water more often. Some plants are only watered from below, e.g. 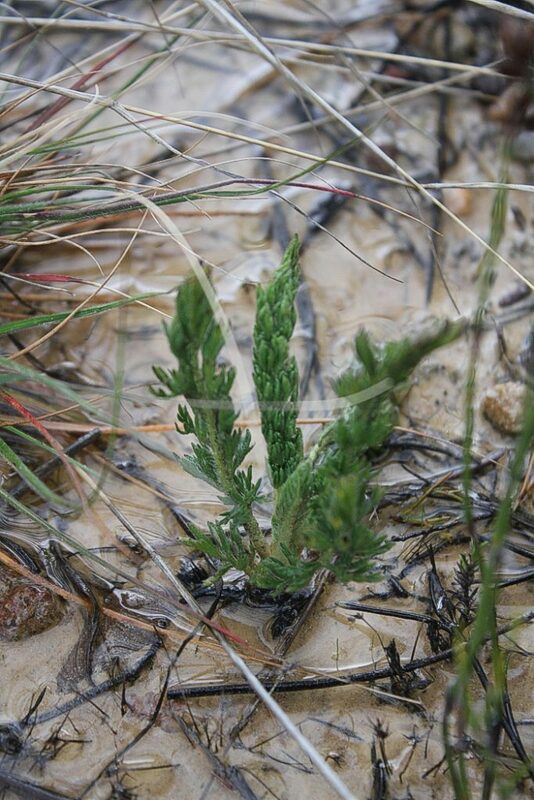 P. sibthorpiifolium, as they actually require no water at the surface level of soil. The art is in achieving moist but not wet growing conditions, although some hoareas do tolerate excessive watering (Fig. 4), but not for long. To cool down the pots in the summer and increase evaporation in the winter (heating to 7-10 oC), I keep one or two fans in the greenhouse always switched on. Fig. 4: Some pelargoniums tolerate excessive water for limited periods of time, however, this is not to be experimented with. On the photo is P. rapaceum at the foot of Matroosberg. As with humans, sunbathing is fine, but some protection is advisable. Depending on the latitude, shading of plants is advisable during summertime. In nature, few pelargoniums grow in full sun and baking heat, and if they do, the substrate is always humid. Established plants of the Otidia and Cortusina sections require full sun in order to achieve compact growth, although in nature these mostly start their lives well sheltered within a larger shrub. Most shrubby species, and specifically P. alternans and P. xerophyton can be pruned regularly. 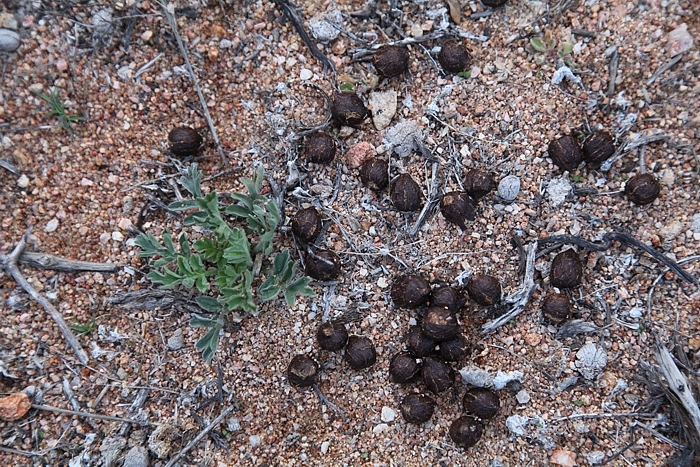 In nature, either livestock or antelopes would regularly take care of this (I once saw a 1.2-m tall P. xerophyton in southern Namibia and it wasn’t a pretty sight, so straggly and untidy was the shrub). Many pelargoniums grow in the shade of grasses, larger bushes, in rock crevices and very often on S-facing slopes (which equals N-facing slopes in the northern hemisphere) so that in the summer they are nicely shaded. Grasses die back in winter and many shrubs are deciduous, so that in the wintertime, winter-growing plants get relatively more sun. Therefore, hoareas can be kept shaded in the summer and unshaded in the winter. Unfortunately, it is very difficult to provide sufficient winter sun in central Europe (Fig. 5). The result can be straggly growth and as a consequence, poor flowering. Fig. 5: Comparison of the average hours of sunshine in Springbok in Northern Cape  and in Ljubljana , with a typical continental central European climate. Well, there is no comparison, obviously. Even after correction for season (July is summer in the N hemisphere and winter in the S hemisphere), Springbok on average receives 100-150 h of sunshine more per month. However, most plants grow in naturally shaded spots in nature, so there is hope for the greenhouse grower, still. Seedlings can be kept under LEDs, which gives them enough energy to make them flower in 6 months. However, providing sufficient artificial light for a whole greenhouse in the winter is more difficult. The only remedy would be to move to a sunnier spot on Earth – not a financially sustainable prerogative unfortunately. Little goes a long way. The natural substrate is very often pure sand and gravel of decomposed granite and quartz, which is poor in nutrients so it is possible to grow pelargoniums well without ever feeding them. Organic matter (especially in peat-based composts) already provides more feed than necessary. However, if growing plants in pure loam and quartz sand, it might be advisable to water the plants with a 1/2-strength fertilizer once or twice a year. After all, some plants in the nature get lucky as well (Fig. 6). Fig. 6: Some pelargoniums are well-fed in the nature, fynbos habitats are particularly rich in decaying organic remains. On the photograph is a particularly fortunate P. incrassatum. Pretty much like people, pelargoniums are incredibly adaptable: sufficient own space, a dry head, cold feet, lots of sun and not too much food will make them happy and healthy. Finally, I guess all of the above depends a lot on the aesthetics we’d like to achieve. Some of my florist friends like their plants plump, green and well-fed. Some, myself included, prefer shapes that develop in harsh growing conditions – pretty much a contradiction in most greenhouses – but at least one can strive for the qualities which make pelargoniums so amazing: their tender flowers contrasted by rough and elementary growth forms. Cite as: M. Strlič: Growing Pelargonium Species, Pelargonium Notes, #1 (2016).